'The balcony 2' is one of his most evocative harbour paintings, encapsulating key elements of Whiteley's art – fluent draughtsmanship, an erotically charged curvilinear line and an ability to invest minimal brushstrokes with multiple associations. Whiteley's return to Australia in 1969 heralded a new preoccupation with colour and beauty. 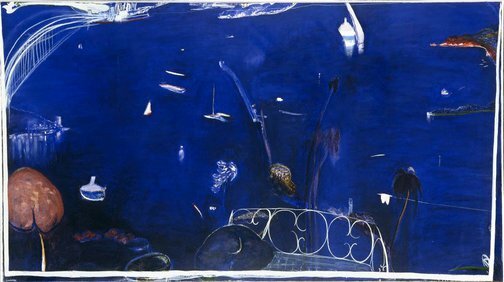 Inspired principally by Matisse, but also by his house at Lavender Bay on Sydney Harbour's north shore, he created a series of large scale paintings of expansive interiors and views evoking the marine beauty of the harbour. Signed and dated l.l. corner, white oil "1975 brett whiteley". Michaela Boland., Weekend Australian , 'Master cards', pg. 9, Sydney, 07 Sep 2013, 9. Elizabeth Fortescue, Daily telegraph mirror , 'Regarding Whiteley', pg. 28-29, Sydney, 09 Sep 1995, 28-29. This article appears in the 'Focus' section of the newspaper. Bill Gregory, Art and Australia (Vol. 40, No. 3) , 'Collecting international art', pg. 454-457, St Leonards, Mar 2003-May 2003, 455 (colour illus.). Jane Hampson, Sun-Herald , 'Brett Whiteley's Images of Sydney Harbour', pg. 15, Sydney, 29 Jun 1997, 15 (illus.). 'Appearing in the 'Time Out' section. Jane Hampson, Look , 'wwwhiteley.com', pg. 17, Melbourne, Feb 2001, 17 (colour illus.). Image of David Williamson standing in front of 'The balcony 2'. Terry Ingram., The Australian financial review , 'Sir John's art fetches $42,000', Sydney, 24 Aug 1981. Appearing in the 'Salesroom' section of the Australian Financial Review, with regards to the sale of `The Balcony 2', acquired by AGNSW. Bruce James, Art Gallery of New South Wales handbook , 'Australian Collection: Painting and Sculpture', pg. 102-181, Sydney, 1999, 167 (colour illus.). Lou Klepac, Affinities: Brett Whiteley & Lloyd Rees , 'Introduction', pg. 2-4, Sydney, 2001, 8. Barbara Konkolowicz, Look , 'Big Blue Sydney Harbour Through The Eyes of Artists', pg. 20-21, Heidelberg, May 1997, 21 (colour illus.). Barry Pearce, Australian art: in the Art Gallery of New South Wales , 'Landscape and gesture', pg. 239-240, Sydney, 2000, 256 (colour illus. ), 257 (colour illus., detail), 302. Barry Pearce, Art Gallery of New South Wales handbook , 'Australian', pg. 13-35, Sydney, 1988, 32, 34-35 (colour illus.). Jennifer Phipps, Members Magazine of the National Gallery Society of Victoria , 'Brett Whiteley Self Portrait and Other Intimacies', pg. 6-7, Melbourne, Jul 1996, 6 (illus. ), 6-7. Appearing in the 'Special Exhibiton' section. Jennifer Phipps role at the time of publication was Curator of Australian Art. Andrew Powell, Departures , 'Sydney[.] She's this decade's Miss Popularity among major cities, the prom queen of the southern hemisphere. And now perhaps just a bit taken with her own image', pg. 218-227, New York, Sep 1998-Oct 1998, 222-223 (colour illus.). David Shteinman, Philosopher , 'Tribute to a Dionysian Free Spirit. 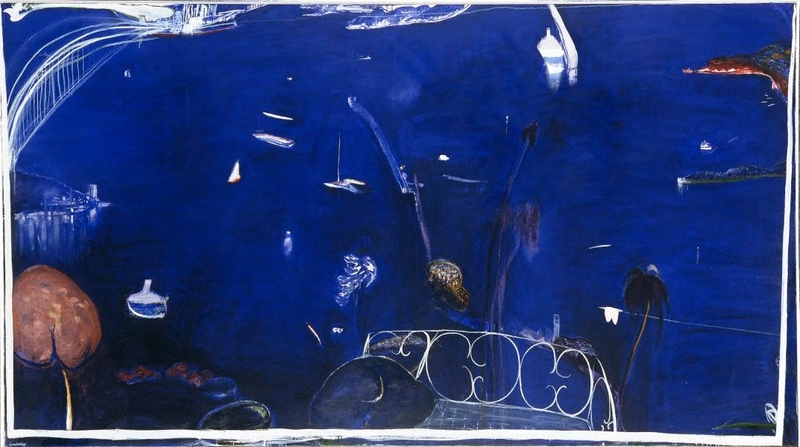 The Brett Whiteley Retrospective', pg. 9-13, Cammeray, (1995-1996), 9-13. Jill Sykes, Look , 'McCulloch's Encyclopedia', pg. 12, Sydney, Oct 2006, 12 (colour illus.). Jill Sykes, Look , ‘Barry Pearce’s next book-call it “segueing with intent”’, pg. 28-29, Sydney, Mar 2012, 28, 29 (illus.). Red, black and Whiteley , North Ryde, 2000, 00:00.43 for 3 seconds (colour, detail). Close up of painting focused on blue harbour and white boats which merges with actual harbour footage with shimmering water. Discusses how alcohol opens up circus of the imagination which Whiteley feared he would not be able to reach otherwise. Sydney: an Oxford anthology , South Melbourne, 2000, front cover (colour illus.). Ken Done: The Art of Design , Sydney, 1994, 32 (illus.). Eyewitness travel guides: Australia , 'Botanic gardens and the Domain', pg. 100-111, London, 1998, 108 (colour illus.). The Sydney Morning Herald , 'Gallery packed as family pays tribute to tragic artist', pg. 5, Sydney, 07 Jul 1992, 5. Art-i-facts, Book One: An exploration of art and design for junior secondary students , 'Structure in art and design', pg. 87-118, Sydney, 1991, 115 (colour illus.). The new McCulloch's encyclopedia of Australian art , Carlton, 2006, 1085 (colour illus.). Sydney Theatre Company Limited Ninth Annual Report 1987 , Sydney, 1987, front cover (colour illus.). Portrait of a Gallery , 'Australian 20th Century Art', pg. 71-89, Sydney, 1984, 72, 72 (colour illus.). 9 Shades of Whiteley , '4: Lavender Bay', pg. 21, Sydney, 2008, 20 (colour illus. ), 21. Art and Australia [vol. 13, no. 3] , Sydney, Jan 1976-Mar 1976, 233 (illus.). Exhibition Commentary: Brett Whiteley at Bonython, Sydney. The Encyclopedia of Australian Art , St Leonards, 1994, 648-49 (colour illus.). The Art Gallery of New South Wales Bulletin , 'Big Blue', pg. 28-29, Sydney, May 1997-Jun 1997, 29 (colour illus.). Big Blue - The painted harbour , Sydney, 1997, cover (colour illus. ).